Engineers use I beams widely in construction, forming columns and beams of many different lengths, sizes, and specifications. Understanding the I beam is a basic necessity for the modern civil engineer or construction worker. The I beam consists of two horizontal planes, known as flanges, connected by one vertical component, or the web. The shape of the flanges and the web create an “I” or an “H” cross-section. Most I beams use structural steel, but some are made from aluminum. Infra-metal constructions, such as carbon structural steel and high-strength low-alloy structural steel, have different applications – such as building framing, bridges, and general structural purposes. Deflection. The builder will choose a thickness to minimize deformation of the beam. Vibration. A certain mass and stiffness are selected to prevent vibrations in the building. Bend. The strength of the I beam’s cross-section should accommodate yield stress. Buckling. The flanges are chosen to prevent buckling locally, sideways, or torsionally. Tension. The builder chooses an I beam with a web thickness that won’t fail, buckle, or ripple under tension. The design of the I beam makes it capable of bending under high stress instead of buckling. To achieve this, most of the material in the I beam is located in the regions along the axial fibers – the location that experiences the most stress. Ideal beams have minimal cross-section area, requiring the least amount of material possible while still achieving the desired shape. I beams have a variety of important uses in the structural steel construction industry. They are often used as critical support trusses, or the main framework, in buildings. Steel I beams ensure a structure’s integrity with relentless strength and support. The immense power of I beams reduces the need to include numerous support structures, saving time and money, as well as making the structure more stable. The versatility and dependability of I beams make them a coveted resource to every builder. I beams are the choice shape for structural steel builds because of their high functionality. The shape of I beams makes them excellent for unidirectional bending parallel to the web. The horizontal flanges resist the bending movement, while the web resists the shear stress. They can take various types of loads and shear stresses without buckling. They are also cost effective, since the “I” shape is an economic design that doesn’t use excess steel. With a wide variety of I beam types, there is a shape and weight for virtually any requirement. The versatile functionality of the I beam is what gives it the alternate name universal beam, or UB. 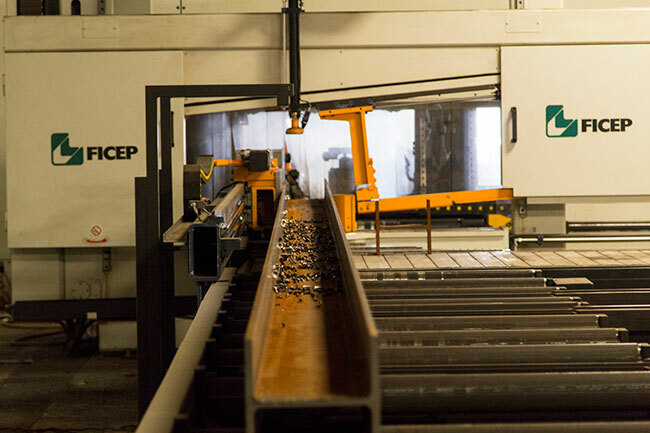 When you need I beams for any type of building application, look to steel beam fabrication for fast, efficient, and affordable order fulfillment. Steel beam fabrication takes a lot of experience, knowledge, hard work, and specialized tools to be successful. Don’t trust just any company with your I beams. Contact Swanton Welding for custom welding and metal fabrication for all types of construction.